Written by FOPAdmin on November 16, 2016 . Posted in Active Member News, FOP Special Events, President's Blog, Retired Member News. 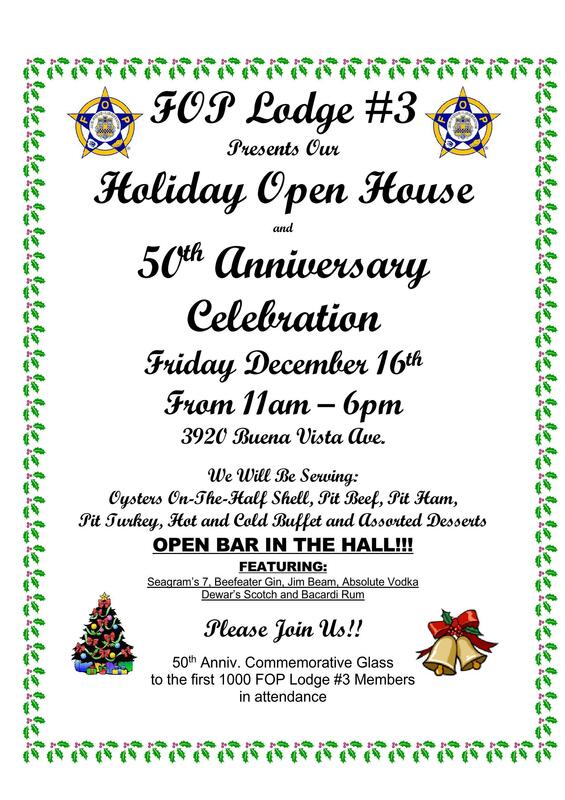 Baltimore City Lodge #3 Presents our 2016 Holiday Open House and 50th Anniversary Celebration on Friday December 16, 11 AM – 6 PM! We will be serving Oysters On-the_Half_Shell, Pit Beef, Pit Ham, Pit Turkey, Hot and Cold Buffet, and Assorted Desserts! OPEN BAR IN THE HALL!!! The first 1000 FOP Lodge #3 Members will get a 50th Anniversary Commemorative Glass!